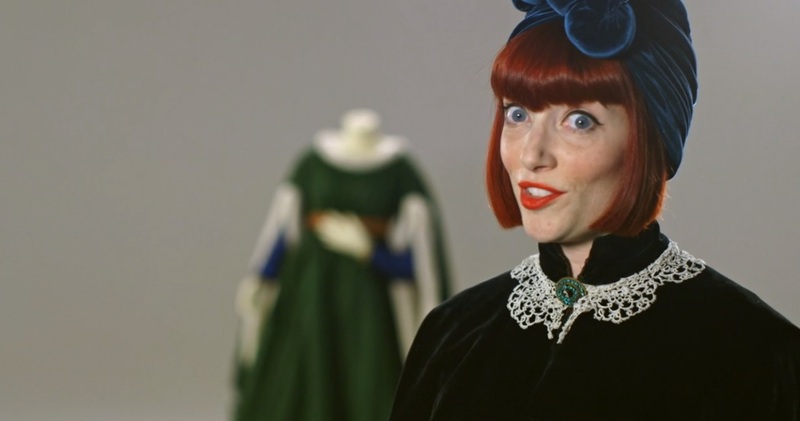 Forget the contradictions of the Arnolfini dress – BBC4’s A Stitch in Time revealed another significant truth about historical costume that affects everyone interested in it. The series presented by Amber Butchart explores the lives of historical figures through the clothes they wore. But standing out more than the Hussar uniform in the back of Ninya Mikhaila’s Tudor Tailor workshop and even topping Butchart’s immaculate red bob was the fact that this was a BBC prime time production pitched in the simplest possible terms to a vast audience. Historical costume has long been a niche within a niche, separated from fashion history with more in common with theatrical design than historical accuracy. Ex-Oxbridge Lucy Worsely’s programmes seem deeply academic in comparison to this London College of Fashion colour. The delivery of this specialist subject could hardly have been broader. Yes, to many A Stitch in Time may have even seemed a symptom of the ‘dumbed down’ BBC with the real work of Mikhaila’s team going on off camera. But in her Instagram-worthy waistcoat and breeches Butchart pitched historical dress almost like she was discussing modern fashion trends. Good media requires delivering complex ideas to the very lowest denominator and anyone watching this could gain a real insight into how historical pieces are made and reinterpreted. The whole process of looking at paintings and original garments is shown with a BBC3-level ease of viewing, something all too clearly seen when she tried on each garment almost giddy with posing. Her attitude to dress is quite easily explained by her CV having been head buyer at Beyond Retro – a successful vintage shop chain that fills its rails with c.1980s denim and flannel shirts. She is also an Associate Lecturer in Cultural and Historical Studies at London College of Fashion, teaching the short course ‘Fashion History: Evolution of Style’, and has published the books of Nautical Chic and The Fashion of Film: How Cinema has Inspired Fashion. This fusion of academia and modern fashion applied to historical dress is an unusual hybrid, especially when Butchart is given accurate tools to punch button holes into a 17th Century coat. The format of object-based episodes jumping literally hundreds of years is engaging without being too cumbersome and the clothes take centre-stage ahead of broader historical commentaries. Based on this programme it would be no surprise if more people take that precious step of buying a historical dress pattern, delve into Pinterest and try to make their own accurate clothes. The broadcasting and style of A Stitch in Time shows this is already happening and last year market research firm Mintel reported a 12% rise in women doing needlecraft as a hobby in the last two years while 17% of men aged 16 to 24 are keen to try. This could be the start of something very big. We were fortunate enough to talk to Ninya Mikhaila herself about working on the series and her incredible background as a leading historical-costumier. Read her interview here!